Caroline Harper still thinks of him every day. For more than fifty years, not a day goes by when Caroline doesn’t think of her brother Andy. The last time she saw Andy was when he left home to spend thirty days at Florida’s largest reform school. Caroline’s family was told that Andy ran away in the middle of the night. Fifty years later, Sean O’Brien receives a letter from a dead man. A year earlier the man had hired Sean O’Brien and chartered his boat for a fishing trip. Now the man is reaching from the grave to hire him again. But this time it’s to find a killer. Jackson County—the location of the old reform school, still carries smoldering baggage from the Civil War, and after a half-century, there are those who don’t want a forensics investigation on the property, because to do so will reveal one of the nation’s darkest secrets. 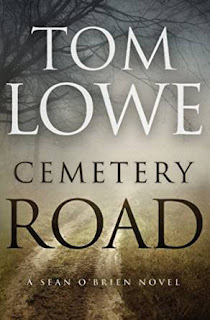 Florida-based author, Tom Lowe, is known for his mystery/thriller series featuring Sean O'Brien, a retired Miami homicide detective rebuilding his life between the Ocala National Forest and a marina in Ponce Inlet. CEMETERY ROAD, released in December, marks the seventh book in the series. Tom is an award-winning documentary writer/director whose films air nationwide on PBS. As he writes his books, Tom draws from his travels around the world and his background as a print and broadcast journalist. Tom is a sailor, windsurfer and SCUBA diver. He lives in Florida with his wife and two dachshunds.